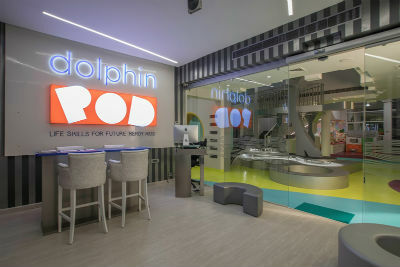 New Delhi: Dolphin POD has launched Asia’s first 21st century life skill training centre for kids in Vasant Kunj, New Delhi. The Centre was launched on Saturday, 23rd September, 2017. The main idea behind the launch of the centre was to make the kids ready for 21st century challenges. The concept is based and inspired from Dr. Shimi Kang’s book “The Dolphin Parent”. The centre enrolls kids from 1 and half years to 16 years. It spreads across 12,000 sq. feet with a play area of around 7, 000 sq. feet. The centre aims to provide a fun, interactive and inspiring education unlike anything children receive anywhere else. By utilizing the latest neuro-scientific methods for Innovation, Social Leadership and Wellness, Dolphin POD teaches the key 21st century skills of Consciousness Quotient (CQ) – Creativity, Collaboration, Communication, Critical Thinking and Contribution. The Dolphin POD method consists of 3 unique experiences – Play (play and exploration): Coach-facilitated play through uniquely sourced stations of hands-on games, puzzles, gadgets, technology, art, drama, and music and body movement. Others (social connection): Communication and collaboration leadership social skills training through breakout sessions, teamwork exercises, role-play and public speaking. Downtime (stress management and wellness): Attention/ focus training, mindfulness and cultivation of positive mental habits such as grit, gratitude and optimism. The duration of the session is 90 minutes, twice a week. Commenting on the launch of the centre, Ms. Shobana Mahansaria, Co-founder, Dolphin POD, said, “We are delighted and proud to launch Asia’s first life skill training centre for kids. With this launch we are looking ahead to provide a solved, successful and easy life to the 21st century kids which will nurture every child’s innate intelligence for the life changing skills of Consciousness Quotient to connect socially, think critically, express creatively and contribute purposefully. Our main motive is to create an inspiring learning community, which is to stretch, challenge and excite a child’s thinking”. In the near future, the center also plans to collaborate with NGO’s for the up-lift men of underprivileged children.